Denali National Park and Preserve is made up of more than six million acres of breathtaking mountain views, winding rivers, glacial lakes, wildlife habitats and more. With only one road to access the park, many visitors have found that the best way to experience this vast, awe-inspiring land is to do so from the air. With 2013 marking the centennial anniversary of powered flight in the 49th state, this is the perfect time to experience Alaska from a bird’s eye view! The road into Denali National Park and Preserve can only be accessed via official park buses, and even if you take the bus you won’t be able to witness but a small portion of the park’s immense area. By taking a tour from the air you can see much more of the park in a shorter period of time. Whether you choose to stay just south of the park at the Mt. McKinley Princess or just outside the park entrance at the Denali Princess, our tour desk representatives can help you find the perfect flight-seeing adventure. You can choose to take to the sky by plane or helicopter. Both options offer, weather permitting, a chance to see the summit of Mt. McKinley, North America’s tallest peak, at 20,320 feet. In addition to the spectacular views of Mt. 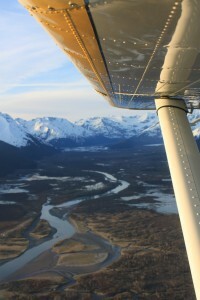 McKinley and the Alaska Range, you will be treated to sights of the park’s stunning glaciers. There are even tour options that give visitors a chance to land on a glacier, witnessing awe-inspiring icefalls, turquoise glacial pools and sparkling moraines along the way. In addition to the scenery, be sure to keep an eye out for wildlife as your soar above the park. Whether it is a bald eagle joining you in the sky or moose, Dall sheep, bears and caribou wandering on land below, seeing these amazing creatures in their natural habitat is something you won’t want to miss! Another benefit to traveling by plane or helicopter is that it is a family-friendly option that can be enjoyed by visitors of all ages and fitness levels, unlike the strenuous physical exertion that comes along with hiking around the park on foot. 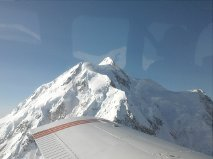 You can check out all available flight-seeing and other once-in-a-lifetime activities in Denali National Park by visiting the excursion page of your Princess Alaska Lodge.